GP is a severe, progressive neurological disease similar to Charcot-Marie-Tooth disease seen in humans. Greyhounds affected with polyneuropathy typically begin showing clinical signs of disease around three to nine months of age. Owners often report an awkward, high stepping gait, exercise intolerance, and “bunny hopping” in the early stages of disease. As the disease progresses, affected dogs often become weak in all four limbs, lose reflexes, develop generalized muscle atrophy, and show greater difficulties with walking and standing. If not humanely euthanized prior to late stages of disease, the eventual paralysis of the larynx and diaphragm often results in death. Polyneuropathy tends to be rapidly progressing with most dogs dying within 10 months of their first clinical signs. GP is inherited in a recessive fashion meaning that dogs must inherit two copies of the mutation (one from each parent) in order to develop disease. Dogs inheriting only one copy are considered carriers of the disease and do not show clinical signs of polyneuropathy. However, when two carriers of the mutation are bred, about 25% of their puppies will be affected with disease and 50% will be carriers. Fortunately for greyhound breeders, a genetic test exists to identify these non-symptomatic carriers prior to breeding. Carrier dogs can be safely bred to dogs that have not inherited a copy of the mutation without fear of producing affected puppies, though 50% of the puppies will be born carriers. Like with other inherited diseases, it is not recommended to breed dogs affected with polyneuropathy because 100% of the puppies born to an affected parent are guaranteed to be either carriers or affected. Polyneuropathy due to the NDRG1 mutation has only been identified in show (bench) varieties of greyhounds. Racing greyhound bloodlines have not been documented as carriers of the mutation. It is probable that the original genetic mutation causing polyneuropathy occurred randomly in a show line of greyhounds within the past few decades. Since very little interbreeding has occurred between the show and racing varieties for the past 60 years, it is possible that the mutation may not be present in racing greyhounds at all. 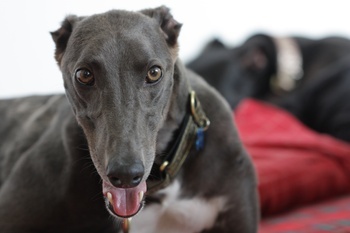 In fact, the authors of the publication describing the associated NDRG1 mutation, tested 112 racing greyhounds and did not find a single carrier of the mutation. In contrast, 84 out of 283 (29.7%) of show greyhounds tested were carriers and 10 out of 283 (3.5%) were affected. Paw Print Genetics offers genetic testing for greyhound polyneuropathy and degenerative myelopathy, another neurologic disease known to affect greyhounds. If you’d like more information about genetic testing of your greyhound or have other questions about canine genetic disease, feel free to email us at AskUs@pawprintgenetics.com or call us at 509-483-5950 to speak to one of our customer-focused staff members!